(FORTY FIVE T H O U S A N D) shirts sold. Our goal is to always TRY to EXCEED. Being condition is relative, and different to different people, our "interpretation" of condition is NOT given. NO EXCEPTIONS. 55% linen 45% cotton. Tons of Shirts, Pants and Jeans. A very nice classy fine shirt in excellent pre-owned condition. Shirt Length (Neckline-Bottom): Approx. No local pick up available. Material: 100% Cotton. Sleeves may be cuffed and buttoned. Distressed painted buttons. Sleeve from Shoulder: 27”. Length from Shoulder to Hem: 29”. Sleeve from Underarm: 21”. Across Chest to Underarm Seams: 23”. 1 chest pocket, french cuff sleeves, "modern fit". 21" long 23" armpit to armpit 27" sleeves. Collar to seam - 28" - shoulder to sleeve - 24.5' - waist - 19". I can fix most most of not all issueswithin 24 hours. Shoulder to Shoulder: 18 ". Sleeve Length: 27". Armpit to Armpit: 23 ". Length (top to bottom): 32 ". 100% Cotton. Blue & White. Size Large. 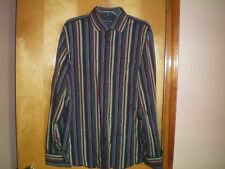 Men's Express Fitted medium blue with white pin striping. Shirt is in excellent used condition. Please feel free to message me with any questions! Length: 32". Shoulders: 20". Armpit to Armpit: 24". 100% Cotton. #90095 Blue & White Striped Fitted Dress Shirt. Style #90095. striped Print/Pattern. These are not used clothes from one's personal collection. Machine Wash. Size - Large 16"-16.5. Blue & White. Style from 2013. 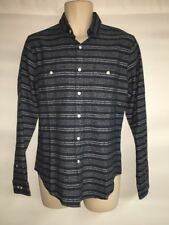 Express Men's LARGE Button Front Shirt Navy & Gray Stripes Linen Blend NWT Retail $69.90 Laid flat, the top measurements are as follows: Arm pit to Arm pit: 23" across Back Length, Bottom back collar to hem: 30.5" long Shoulder seam to Shoulder seam: 19" across Sleeve Length: Shoulder seam to sleeve hem 26" long. My items are overstocks, or customer returns. Some items are "new with retail tags" and will be listed accordingly. Some brand labels or tags have been removed, stamped or black lined to prevent store returns. MATERIAL : Linen / Cotton. LENGTH 28 in. CHEST 22 in. Pit to Pit:22.5'. Size: Large. BUST 22 in. MATERIAL : Cotton. GREEN W/ WHITE & GRAY STRIPE. BUTTON FRONT SHIRT. SHORT SLEEVE. If there is a problem with an item give us a chance to make it right. CONDITION---THIS ITEM IS GREAT CONDITION. Shoulder (between shoulder seams).19". Sleeve (shoulder-end of Sleeve). Chest (armpit-armpit)..23". Fabric content: 100% Cotton. Length (neckline-bottom). Odds are if you find one thing you like, you will find many more. I will get back to you very soon. 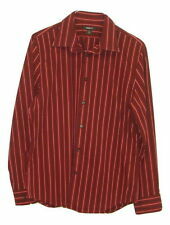 -Express Design Studio Green Striped Long Sleeve Button Down Shirt Men's Size L Thank you for supporting our small family business. Length 28". Sleeve 26". Shoulder To Shoulder 19". Chest (Pit to pit): 24". Sleeve: 35/36". MATERIAL : Cotton / Spandex. BUST 22 in. LENGTH 30 in. Color- Multi-Colored Stripes. Shoulder to shoulder (Shoulder seam to shoulder seam)- 19". Sleeves (From shoulder seam to end of sleeve)- 26". Length (From bottom of collar to the end of the shirt)- 32". (FORTY FIVE T H O U S A N D) shirts sold. Being condition is relative, and different to different people, our "interpretation" of condition is NOT given. Our goal is to always TRY to EXCEED. NO EXCEPTIONS. Light blue, light green and white stripe button front. No holes, snags or stains. Made of 100% cotton. Pants are listed as side to side on waist(not all the way around) is "across" then inseam is "inseam". Length 28". Sleeve 27". Shoulder To Shoulder 19". Sleeve - 26" (Top Shoulder Seam-End Sleeve Cuff). Total Length - 32" (Top Middle Collar-Bottom Rear). Length - 25 3/4" (Shoulder - Hip).